So the original people had some children’s book that was actually significant to both of them. They framed all the pages and hung them up and it was super cute. Instead of going with a book that was significant to me, I just searched for a children’s book that had giraffes in it. Because THEMES, guys. I dunno. It’s a cute book, either way. Y’all. I cut these pages out, cut strips out to border them, and framed all of them, when I was SUPER pregnant. Picture me flopping around on the concrete floors downstairs, cutting all this nonsense up and taping it and framing it. Ugh. I even took pictures, because I was going to post a sort of tutorial thing. Wade turned 2 in April, y’all. I’m at the point where I want to redo his room (for many reasons) and only just now started hanging art. Oops. Trying to line up 32 nails was tedious af, too. I actually started this a few weeks ago and got it about halfway finished, then finally got the rest done today. Not that I’m overly impressed with the end result or anything. I’m really quite “meh” over it. If I had actually gotten it up on the wall 2.5 years ago I probably would be at the point where I was ready/willing to take it all down for something new now. But I’m happy because it’s finally finished. But, yeah. I totally want to redo his room. 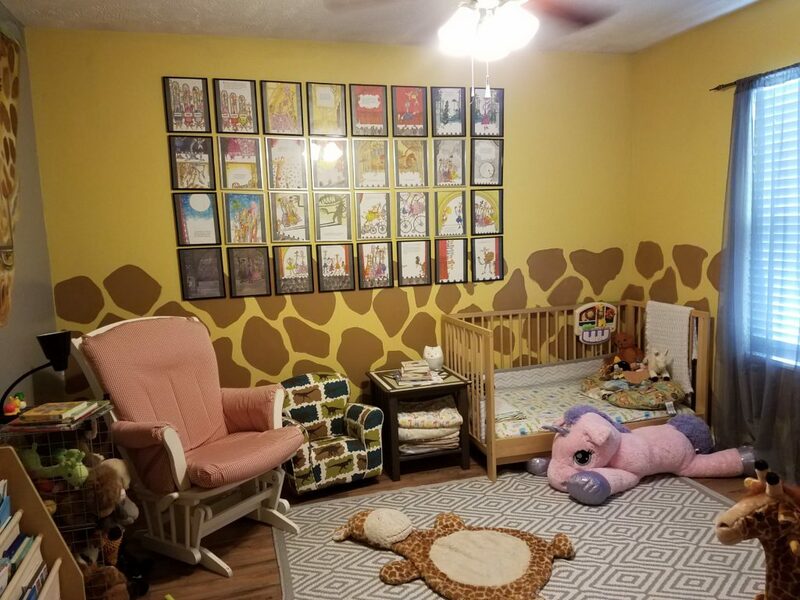 I’m thinking chalk paint up to the top of those giraffe spots, then one of those chair rail wooden strip things, and then…what sort of wall color? Should the wall to the left still be an accent wall (right now it’s a mural) or should all the walls match? Ugh, I have a million other home projects to get to before I can touch his room. So for now it’s excellent. Good job, me!